In the aggregate, the science fiction mediocrity for all time. 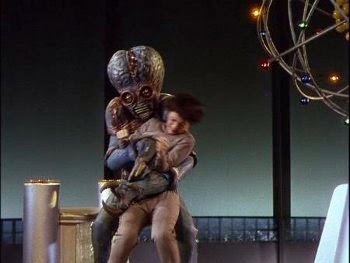 Here's the thing about This Island Earth: no one really seems to know for a fact if Jack Arnold shadow-directed the last third of it or not. Yet it is a story that has been repeated so often—by B-movie scholar Tom Weaver, by IMDB, even by guys on the street, if you live on an especially dorky street—that it might as well be true. The claims that he did direct it are loud and seemingly accepted as common knowledge; the claims that he didn't are few and far between, and range from vague references to "a British film critic" who said it was a myth to a guy on Facebook who says his friend Rex Reason said that Jack Arnold showed up on set for a few days and observed, but took no active part in the shooting. I wasn't there, so I can't know. Maybe he didn't. Well, I wish. I'd rather review Tarantula. But hold on there. 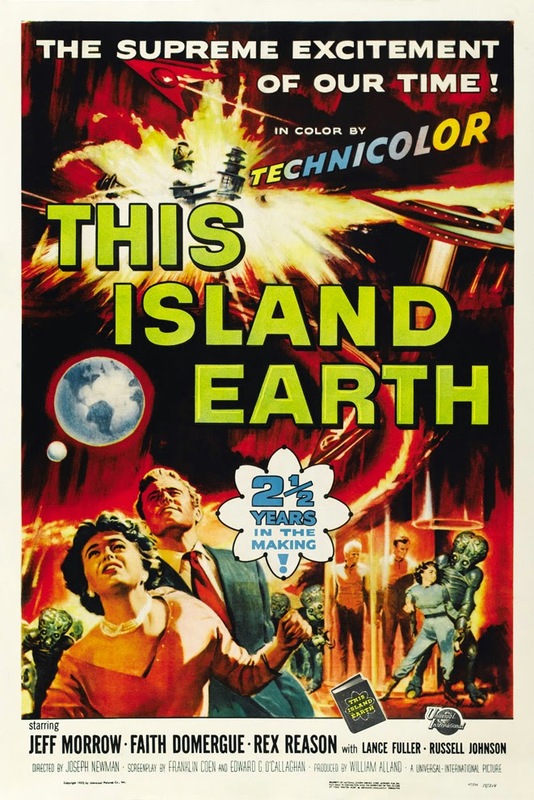 Whatever else it is, This Island Earth is one of the most personally important movies I've ever seen—for Island is famously, and infamously, the subject of Mystery Science Theatre 3000: The Movie, the only form of MST3K available to me in my tender adolescence. I lived in the country, and aside from explaining my retarded social skills, this also meant we had no cable; but the video store did have a VHS of The Movie and I rented it once a week for months on end. So maybe it's nostalgia talking when I go against the grain of MST3K fandom and declare The Movie one of their finest hours (and twenty minutes); it's so packed full of top-notch jokes that, to this day, even as I watched This Island Earth without the help of Mike Nelson, Kevin Murphy, and Trace Beaulieu, I was still hearing their lines in my head and laughing softly through much of the picture. And if this were MST3K: The Movie, I'd give it an A+. One of the criticisms often leveled against The Movie is that Island is some kind of sci-fi classic, unsuitable for riffing. And in fairness, the uncut version is a slightly more sensible machine. But to such a claim I still have to ask you: why did you quit taking your medication? Yes, there are elements of greatness in This Island Earth, some kind of "on-paper-this-all-works" quality propping it up. There are elements that even work on the screen. It's enormously tempting to dismiss how fresh and exciting this must have been in 1955, when three hundred hours of Star Trek and six Star Wars movies and God knows how many other motion picture space operas are available to us here in The Future—because in 1955, it was close to none—and, in Technicolor, I believe exactly zero. So dismiss it we shall, because we do have access to far superior examples of the genre, from Forbidden Planet made the very next year to Guardians of the Galaxy, still in theaters as we speak. Unfortunately, Island is the space opera that almost never starts, victim of a script that appends an extended prologue to what is, at its core, a two-act story. I don't think it was ever consciously padded, for the film seems far too interested—exasperatingly too interested—in its bogus mystery mechanics, such as would one day inspire folks like Spielberg and Dante to do much better with the same basic kind of plots. Here's Cal Meachum, played by the bassy Rex Reason, the man with such a perfect pulp name it's almost a shame he's real. In his stolid manliness, Reason conjures perhaps the single most science of all possible science heroes. He has a High STEM Ph.D., and the fame that (apparently) comes with it; he is on the verge of a nearly-alchemical atomic discovery that promises a veritable fission-driven utopia; he ventures deep into the unknown and remains unflapped by what he finds; he has a submissive assistant who is shorter than he is; he is decidedly at ease around pretty girls; he punches a peaceful alien who wants to make him do math problems; and, finally, he owns a P-80 Shooting Star that he flies everywhere, instead of taking the bus, like your dad does. Thus did ten year old boys, who could not know they were being condescended to in the worst way, meet their idealized future self. The failure to achieve the impossible standard set by Dr. Meachum may go far in explaining the pathologies endemic to the Boomer psyche. Meachum is also not in any meaningful way the protagonist of this film. He's just the character the camera is trained on most of the time, particularly in the endless first "act." In retrospect, it's obvious that when Meachum's P-80 craps out and the enigmatic green glow takes control of his aircraft, he should have been abducted right then, secreted away by the mysterious forces who need his atomic brain. Instead, they test him by having him assemble their furniture, or an Interocitor as they call it, a magic window with death rays that can do any damned thing the script requires. There are notes of weird interest, from a manual made of "some kind of metal" to the creepy pilotless plane that eventually arrives to carry Meachum to his unknown destination, but there's no melody, and no reason why Meachum would not photograph everything and call in an army of engineers to examine the super-science apparatus his would-be employers have given him, instead of heading with every nuclear secret he has into the midst of a shadowy cabal who, in a best case scenario, are run by a James Bond villain. MST3K made whole bales of hay out of the seemingly unavoidable fact that Exeter and his moody henchman, Brack, are—quite patently—not from Earth. But avoidable it turns out to be: it is almost an hour in before the movie directly acknowledges the obvious, instead contenting itself to dance around the issue, giving a man who was in school for a quarter century "suspicions" and "doubts" and lines like "Metaluna? That's not in this solar system!" Exeter is incarnated by Jeff Morrow, and he is chief amongst those "elements of greatness." Morrow, for all intents and purposes, is alone in every scene, whether there is actually anyone else in the frame or not. He gives the conflicted alien conqueror substantial and subtle dimensions, while everyone else is content to give performances that range from one to, sometimes, two. It is Exeter that Island is really about; his near-absence from the first third of the film desiccates it almost beyond salvation, rendering each scene without him hideous. Compared to Exeter's inner conflict, Meachum's inept conspiracies to escape are meaningless hijinks on the level of a bad sitcom. But credited director Joseph Newman didn't understand, and in the middle act the focus is ever-pulled away from Morrow's compelling portrait of a sensitive colonial overseer, so that we can visit with Meachum and his comrades, Drs. 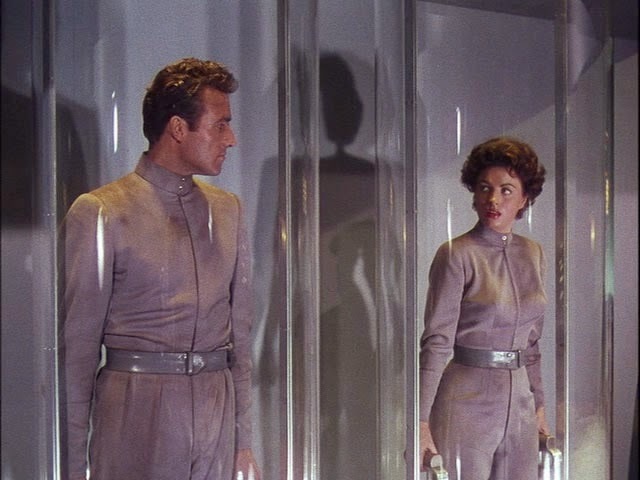 Ruth Adams (Faith Domergue, known for her proto-strong female characters in a time largely devoid of them) and Steve Carlson (Russell Johnson, who would pioneer coconut science into undreamed-of realms). It is only when Exeter is commanded to return to his homeworld of Metaluna—and to bring Meachum and Adams with him—that Island finally becomes what film scholars refer to as "good." And this brings us back to the Arnold Question. 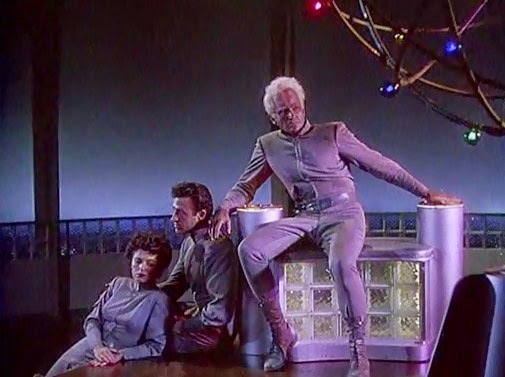 The story goes that William Alland was displeased with Joseph Newman's work, especially regarding the effects sequences, as well he might have been, although the basic concept inherent to the Earthbound effects—"a television with disintegrator beams attached to it"—is a would-be metaphor so goofy that probably only Terry Gilliam could really make it work. In any event, Alland asked his old colleague and friend Arnold to step in and direct the effects-heavy sequences on Metaluna. If I wanted to apply some kind of textual analysis to This Island Earth—and I don't, because as I've said over the course of this ad hoc retrospective, Arnold is a director with a quiet style, not particularly unique in his visual language—but if I did want to, I would claim with some small degree of certainty that I knew exactly the series of shots where the Arnold-directed fraction of Island begins. Because there is the most illegible director's signature there, signed in the same handwriting—literally—in every one of his previous sci-fi films: the hand reaching in from the side of the frame to harmlessly startle whoever's in it. It's subtler here than anywhere, not the silly jump scare it usually is, but maybe it's a gentle poke to those who'd know. 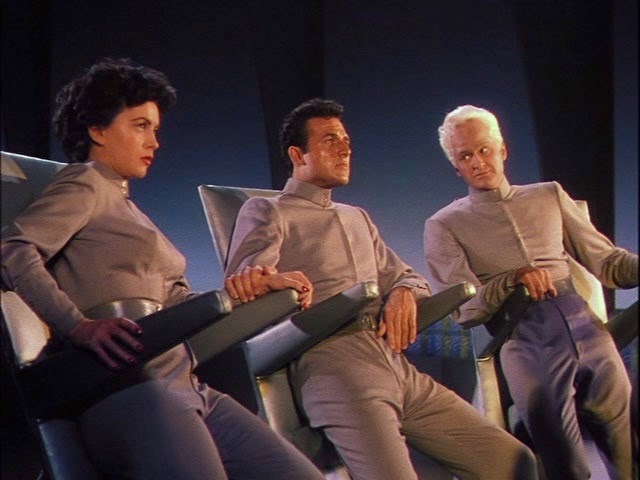 Whether it be Arnold or Newman, as soon as Meachum and Adams are aboard the Metalunan saucer, the director certainly becomes vastly more engaged with the material; but who could blame whoever it was, because the material becomes vastly more engaging. Either way, suddenly compositions start happening, interesting lighting occurs, hints of acting can be found outside of Morrow's performance, and, above all, the film becomes the moving cover of a pulp sci-fi magazine, unstoppable for its last thirty minutes. It is Metaluna that elevates a mere alien infiltration into space opera, building a universe that exists without need for special reference to Earth. And it's Metaluna that makes people remember this film as fondly as they do. Subject to a devastating kinetic bombardment by the genocidal, never-seen Zagons, we learn why the Metalunans eye the Earth and need uranium—the latter to help win their war, the former as a new home if they lose it. And they will lose it: Arnold or Newman, along with special-effects guru Clifford Stine and a legion of artists and artisans, create a genuinely apocalyptic atmosphere on the doomed planet, mordantly beautiful, emphasizing the loss of billions and all their culture. And the Metalunans' dysgenically-bred slaves—"Mu-Tants" as Exeter calls them in Morrow's delightful 1950s cadence—are good fun for the kids, their grotesque appearance based on a (rightfully) rejected design for the aliens in It Came From Outer Space. I'm sure the Metalunans find a thing with claws for hands valuable for all sorts of manual labor. Without Morrow, though, all this would simply be pretty lights. Bleeding to death as he defies the totalitarian control of the Monitor, carrying Meachum and Adams back to Earth from his dying world, Exeter witnesses the black night-side of Metaluna begin to glow with the heat of a sun. Delusionally, but in some distant way aware of it, he hopes that it will warm another world, and "still serve a useful purpose." Meachum looks at him with profound sadness, or as close to that emotion as Reason has the ability and willingness to convey. In a better film, Morrow would bring tears to the eye. In Island, so unfocused and dull for so much of its runtime, he still almost makes the whole thing worth watching, and as for the parts that emphatically are, it is Jack Arnold, or his spirit, that takes them the rest of the way. The Interocitors are pretty much the definition of this. Specifically, the Interocitors are used, inter alia, as godlike spying devices. Indeed, in the early, definitely-Newman-directed scenes, they depict edited footage of just whatever the hell it was Newman's second unit director had photographed. There is a "thermal barrier" around Earth that must be traversed, I guess (we usually call it "the atmosphere") but it is not 30,000 miles up, which the Metalunan saucer's viewscreen is definitely depicting. Small kudos are due to someone considering that two worlds, alien to one another, would have markedly different pressures, though of course this was mainly an excuse for a neat fade effect. However, "pressure" does not make someone turn into mist. Wait... the Zagons' home planet was once a what? A comet? Exeter's Sun Monologue, if unwisely taken at face value, is the dumbest thing ever written about astronomy. The Metalunan Monitor takes Meachum to task for his anthropocentric hubris. Meachum responds, "Our true size is the size of our God!" I don't know; if God loves any particular species in this movie, it's the Zagons. Metaluna is one of the early alien civilizations on film to have even a vaguely-sketched functioning society, when Exeter points out the schools and recreation centers destroyed by the Zagons' attacks. Mongo this ain't. The Metalunans are also one of motion pictures' first and most iconic bumpy forehead aliens. 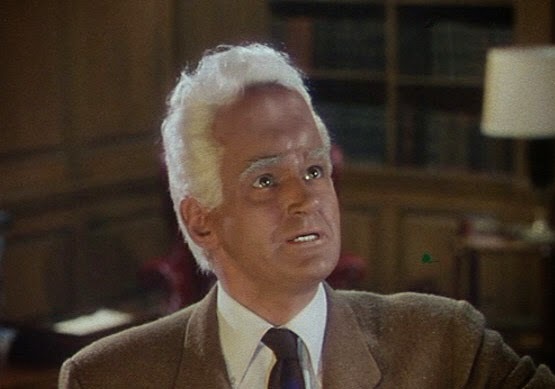 The technique marks the actor as an other without robbing them of empathetic qualities, and it would become ubiquitous in the Star Trek franchise, amongst others. In a bid for symbolism that surely must have been intentional, Exeter's side—Exeter's right side—is pierced by the spear claw of Longinus the Mutant in the midst of his sacrifice for humankind. The lesson is pretty clear: space war is not healthy for flowers or other living things. Did you catch that? Good.